Small Parts are smaller documents that you can merge together into new and unique documents. For any document that has to be created often - such as invoices, quotes, reports etc. - Small Parts are an easy solution. You split up texts that you use often for document creation into smaller parts (i.e. Small Parts). 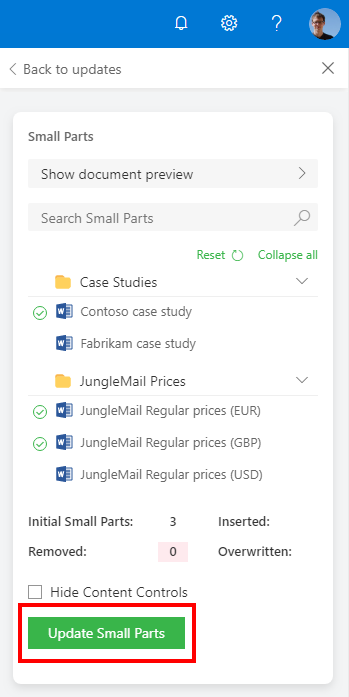 Once you have split your data into these smaller parts (separate documents), you can use JungleDocs for Office 365 to select which of these parts you want to use to create a new and unique document. You do this by checking boxes. Keep in mind that you will not be able to select items that are located in sub-folders. 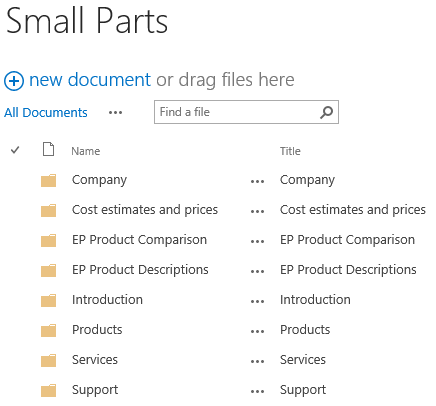 To create a Small Parts library, select Settings > Add an app. Name the library Small Parts. Inside this library, you can create folders that will hold your Small Parts. A good way to structure these folders is by documents they contain (for example : Pricing | Product Information | About Section). Add documents that contain the Small Parts that you want to use to these folders. After you have done this you will link your Small Parts library to a certain JungleDocs rule (see next step of this tutorial). 1. Add Small Parts to Small Parts library (explained above). 2. 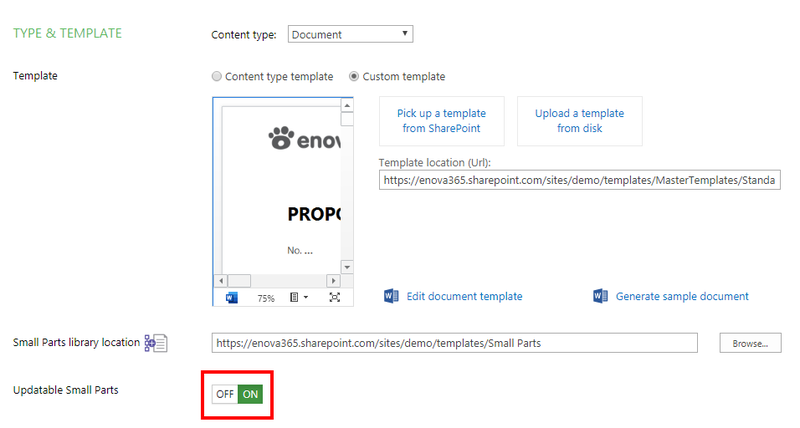 Open your document template via a specific rule or by opening a new document. 3. 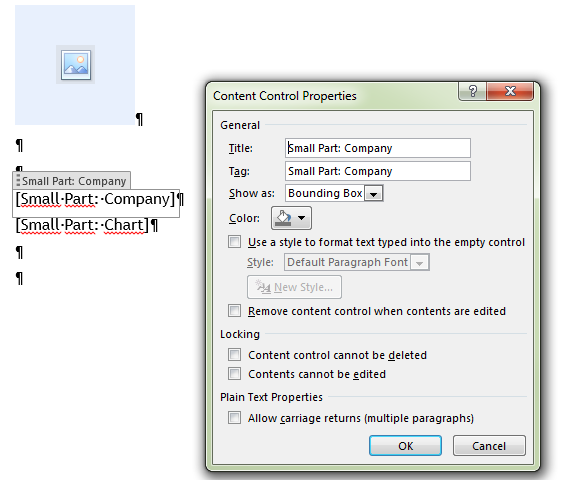 Add Rich Text content controls in the places you want to insert Small Parts. Use the following tag: Small Part: Folder Name (for example, Small Part: Company). 4. Assign the document template to a JungleDocs rule. 5. Assign the Small Parts library to the template. You can add, edit or delete Small Parts for an already created Word document that has Small Parts in them. The document's content is then updated accordingly. This feature is only available in the Modern UI view. 3. Turn on the Updatable Small Parts toggle. 1. Select any rule that has Small Parts configured. 2. Select Edit rule and turn on the Updatable Small Parts toggle. This will enable the feature for this rule only. 4. Select any document that you previously created using this rule. 5. Open JungleDocs for Office 365 via Modern UI and select the Update tab. 6. In the Other actions section, select Update Small Parts. 7. Select and (or) rearrange the Small Parts checkboxes and click Update Small Parts. This will change the document's content accordingly.